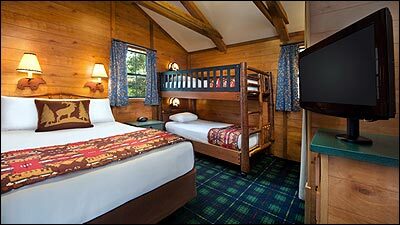 Fort Wilderness is Disney's version of "roughing it." At nearly 750 acres, this expansive complex is home to campsites for both tent camping and RVs as well as fully equipped cabins that sleep up to six guests. 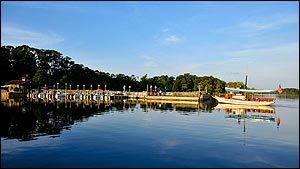 The Fort has several dining and recreational options, including two swimming pools, playgrounds, archery, horseback riding, an arcade, boat and bicycle rentals, and fishing excursions. 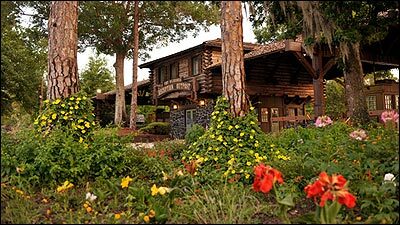 Fort Wilderness is home to Walt Disney World's most popular dinner show, the Hoop De Doo Musical Revue. What can I expect to pay for a campsite or cabin? Sites with partial hookup range between $52-$104 per night. Sites with full hookup range between $69-$128 per night. Preferred/Premium sites range between $81-$143 per night. 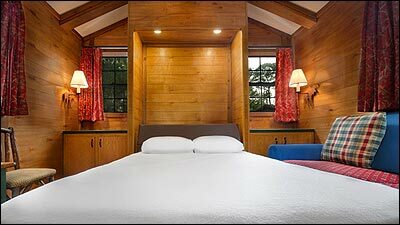 Cabins range between $309-$445 per night. 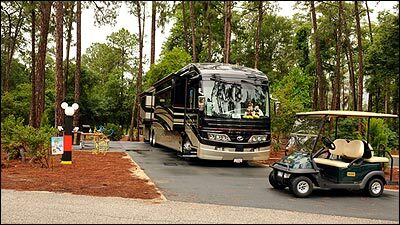 If you are on a budget or enjoy the outdoors, the campsites at Disney are among the best. The facilities are up to Disney standards and there is a quiet peacefulness in this resort. There are 799 traditional campsites. They feature electricity hookups (30/50 amp), water, sanitary disposal, free Wi-Fi and cable television hookups. 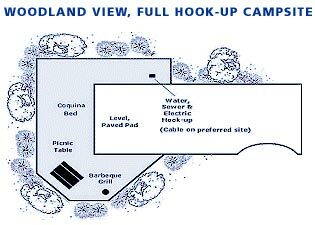 Partial hookup sites provide only electricity and water. All campsites feature a paved driveway pad, picnic table, and charcoal grill. Campsites allow for occupancy up to 10 people total. The loops are divided into 2 categories, preferred or non-preferred. The preferred camp sites are located closer to Pioneer Hall, Settlement Trading Post, and the beach. They are priced slightly higher. Loops 100-500 and 700-1400 are classified as preferred sites. Loops 1500-2000 are far away from Ft. Wilderness activities, but they are quieter and more private. 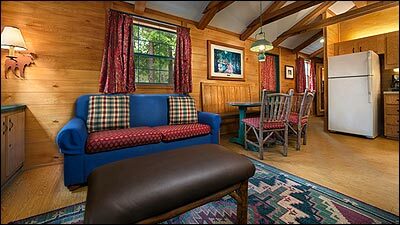 The Fort Wilderness Campgrounds provides numerous air conditioned comfort stations. The facilities include showers, restrooms, laundry, pay phones, and ice machines. They are open 24 hours a day. Please Note: Special pet sites are available at $5 per day. Guests must request the pet sites at the time of booking .... as these loops are limited. Waggin' Tails dog park allows off leash play. Kennels are also available. Visit our Pet Care Kennels page for details. There is a $2 a day per adult charge for more than two adults on campsites. A $5 a day per adult charge for more than 2 adults in a Cabin. Wilderness cabins are "log cabinesque" type dwellings (504 sq. ft.) that sleep up to six. The Wilderness Homes are trailer type pre-built homes that sleep four or six depending on the model. Don't be fooled, these are pleasant resort homes in a great surrounding. Standard features include a fully equipped kitchen, free wi-fi, two televisions, a DVD player, full bath, air conditioning, daily maid service, grill, picnic table, living area, dining table, private deck, safe, hairdryer, iron, ironing board, bunk beds and crib. 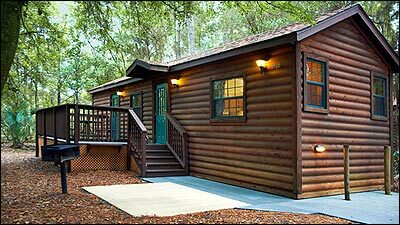 Cabins can sleep up to six guests. Mosey on down to this rustic dining location at the Fort. Featuring buffets for both breakfast and dinner and a la carte lunch dining, you will find down home favorites at great prices. Grab some grub to go at this old west eatery. Food: Pizza, buffalo wings, chicken wings, nachos. Specialty drinks, wines by the glass, smoothies and milk shakes are also served. Enjoy an all you can eat feast while you stomp, clap, and laugh aong with the hijinks on stage. Fried chicken, smoked BBQ pork ribs, corn, baked beans, tossed salad, bread and strawberry shortcake are on the menu. Unlimited draft beer, wine, sangria and soft drinks are served. Visit our Dinner Show page for member feedback, more details and prices. Mickey’s Backyard BBQ, an all you can eat dinner and dance featuring entertainment and character experiences. Feast on barbeque ribs, smoked chicken, hamburgers, hot dogs with all the trimmings, corn on the cob, macaroni and cheese and more. Drinks include lemonade, fruit punch and soft drinks, plus complimentary wine and beer for Guests 21 years of age and up (proper ID required). ADR: Required, Advance Payment Required. Located at the Meadow Pool Complex. Operates on a seasonal basis and may be closed during low occupancy. Signage will direct Guests to visit the Meadow Trading Post when the Snack Bar is closed. Salads, hot dogs, sandwiches, frozen novelties, beer, soft drinks and smoothies are available. Swimming: There are two pools onsite. The Meadow Pool is the feature pool with a 67 foot long corkscrew water slide, spa, kiddie pool and adjacent Fort themed water playground with mini slides and sprayers. The more serene Wilderness Pool features a spa. Fun for Kids: There are two playgrounds at the Fort. One is near Clementine beach and the other is near the Meadow Pool complex. A petting zoo complete with pony rides and playground is also available. Pony Rides are offered daily from 10:00AM to 5:00PM, at the Petting Farm located between the horse barn and Pioneer Hall. Children (ages 2-8) must weigh no more than 80 pounds and be no taller than 48". Parent must lead the pony. $8.00 per ride, cash only. Fort Wilderness Archery Experience: Kids 7 and up can learn to shoot a compound bow at this 90 minute archery experience. Reservations are suggested. Class size is limited to 10. Price is $39.00 per person. Chip ‘N Dale Campfire Sing-A-Long is offered nightly at 8:00PM. The event takes place behind the Meadow Trading Post, Chip 'n' Dale, followed by a cartoon and a full-length Disney movie. Free of charge to resort guests. Movie starts at 8:40PM. Games: There are two arcades. Daniel Boon's Wilderness Arcade is located near the Meadow Pool. Davy Crockett's Wilderness Arcade is located in Pioneer Hall. Fitness and sports: Paths for walking and jogging are located throughout the Fort. Tennis, basketball, horseshoes and volleyball are all offered. 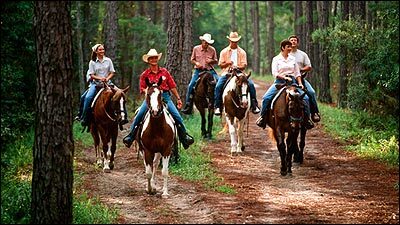 Fishing excursions, horseback riding, carriage rides, bikes and boats are also available. The Bike Barn is open from 8AM to 6PM (last rentals at 4:30pm). Resort guests may rent bicycles, canoes, paddle boats, fishing poles, and tennis equipment. Reservations may now be made by phone for electric carts up to one year in advance. Guests should call the Bike Barn directly, at 1-407-824-2742. Electric Car Rental Golf Carts: *$43 for 24 hours. Prices do not include tax. Guests must be 18 with a valid driver license to rent and drive. *subject to change. Bus: Bus transportation is available to the Magic Kingdom, Epcot, Disney Studios, Animal Kingdom, Water parks, and Disney Springs. Pioneer Hall, Meadows Trading Post, Settlement, Outpost, Creekside Meadows, Meadow Complex and all internal campsite stops. Check in time for camp sites is 1:00 PM. Check in time for cabins is 3:00 PM. Check out time is 11:00 AM for both.